Don’t throw out the baby with the bathwater, or so the saying goes. 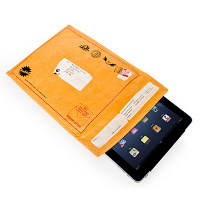 I think it is time to update that particular phrase with this – don’t throw out your iPad with the Stealth Tablet Envelope! This £14.99 purchase will let you tote about your tablet incognito, although it would be best if you were to live alone. Otherwise, other people living under the same roof as you might think that this is trash, and throw out your tablet inside along with it! One great thing about such a disguise would be the ability to prevent opportunistic thieves from getting their hands on your tablet, as the ‘envelope’, from the outside, looks pretty standard issue, and most probably they would think that some documents are inside instead of a tablet. If you want to up the realism ante, just stick a few stamps on it and you are good to go. Capable of holding tablets up to 27cm x 20.5cm in size, this is one low profile tablet case that you might want to look into if being understated is your cup of tea. Salt Water Fuel Cell Giant Arachnoid Kit – Yikes! Or you could, you know, just buy a padded envelope. Might be cheaper. I got a $20 letter envelope I’ll sell you, for your Iphone.